The Pineapple Foraging Pinata is full of texture and chewing fun for your FID! Made of tightly constructed palm, sisal and coconut fiber, the pineapple gives your bird a place to climb up, chew, preen and forage. Use your imagination and hide seeds or treats in any or all of the nooks for your bird to enjoy while encouraging their natural foraging behaviors. 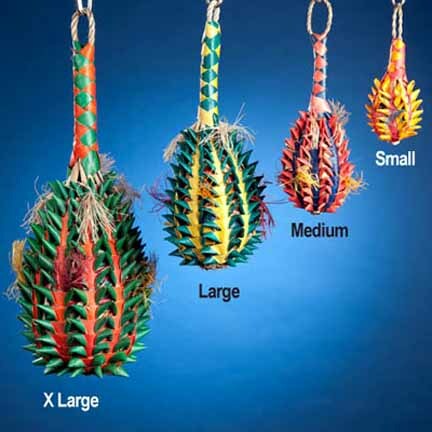 This all natural toy is durable, colorful and easy to hang with a rope loop on top. With four sizes to choose from, there is the right size for those Busy Beaks in your home! Please remember that all Planet Pleasures toys are handmade so it's normal for the sizes vary a bit.